For this tournament season Corvus Belli has added a new mercenary unit to all the vanilla Infinity factions: Cube Jägers. I’m super interested in Airborne Deployment troops and the Jäger is the most 40k thing in Infinity right now (it’s essentially an Apothecary, running around harvesting geneseed—I mean, cubes—from dead troopers). So when a discussion about it came up in our local group my comments got long and I’m posting them here. Along the way I hope this post introduces useful general ideas for newer players toward evaluating troops (not that I consider myself especially experienced at Infinity). Comments, questions, and corrections are welcome! One quick real life sidenote is that I’m not excited about models exclusive to winner’s kits. I really liked the Scarface Turner model last season and being able to buy it would have tipped me over into picking up his TAG, which I was seriously considering for a while. At least in the Jäger’s case there are plenty of very similar proxies to choose from (Scarface had a lot of unique personality) and I like the model but aren’t super captivated by it (I think the green Tohaa “hair” on the demo model is putting me off). More important: Gameplay, starting with availability. Unlike Scarface in the previous season, the Jäger wasn’t added to any of the sectorials (as far as I can see spot checking). So whether it’s a useful troop or not depends in the first place on whether or not you’re playing a vanilla faction. Otherwise it’s not even an option. The Jäger also only has an AVA of 1, so beyond that you’re back to your usual choices. Assuming it’s available, next up is the troop’s profile and options. First thing to note is that, fairly unsurprisingly for a mercenary, the Jäger is Irregular. That’s a big tradeoff, but less punitive than on a typical trooper because it only matters for at most 2 turns under Airborne Deployment. If you’re bringing a Jäger you’re also probably doing so to achieve a specific active task, so presumably it has something to do each turn and being Irregular isn’t a big limitation. That’s different from, say, a Crusader or Akalis airborne troop that I might bring mostly to drop in and cover a forward area with Suppressive Fire while their Regular order is used elsewhere. Second is that the relative utility of Airborne Infiltration versus the higher levels of AD, most commonly Combat Jump, depends a lot on the size and density of the boards you play on. The local tournaments I play in tend to have very very dense boards. Every other month they are also RECON+ events on 2×3 tables. Pickup play naturally goes similarly. In the overwhelming majority of my games therefore there are limited viable options to drop in versus walking on. So for me, having Airborne Infiltration isn’t hardly different in practice from having Combat Jump. In other scenes that won’t be the case. Third, the Monofilament Close Combat Weapon I see as at best a small bonus for hunting TAGs and Heavy Infantry rather than a primary feature of the Jäger. On this troop it doesn’t seem that scary. The Jäger has no Smoke to shield an advance toward close combat and that could be tough for squadmates to provide given it’s likely arriving forward on the battlefield—if it’s easy to get the smoke up there, you probably have better forward CC options anyway. Further, most of the units for which I find Monofilament terrifying (TAGs, Father Knights, etc.) have the edge against the Jäger in CC even if it manages to Stealth in without getting shot. We do have to allow somewhat that CC without genuinely superior skills is very unpredictable due to the low number (B) of D20 rolls. The Jäger could win these matchups; but you can’t count on it. So the limited value I see for the Jäger’s Monofilament CCW is to quickly kill TAGs and HIs that have been Immobilized with the E/Mitter, the latter being the real threat because at that point they’re mission killed anyway. The Jäger would be more efficient without the Monofilament CCW and presumably thus lower points or SWC. Doctoring: A paramedic coming in up the battlefield could resuscitate your prime mover without having to spend orders following behind them or getting there. Suppression: Walking on with an SMG to cover a forward area with Suppressive Fire and deny the enemy easy movement in that space could be useful. Trooper Hunting: Appearing on the side edges with a Boarding Shotgun can be a fun way to hit advancing troops from their rear and either stop or divert their forward thrust, or to go after backfield cheerleaders. TAG/HI Hunting: Coming in behind advancing Heavy Infantry or especially TAGs, because they’re more likely to be visible, and tagging them with an E/Mitter can really neuter your opponent’s main weapons. Button Pushing: A Specialist with Airborne Infiltration can be real handy to tap objectives, especially on RECON+ boards or missions with many objectives where they will be easier to reach from the sides. That might seem like a lot, but there are many other roles in the game. Most obviously, between its abilities, weapons, and BS, the Jäger is not, for example, well suited to provide any kind of relatively static mid-to-long range fire support. The Jäger’s ability to arrive late & either forward or somewhat flexibly where you need it also puts it in a different class of these roles: It’s not just Suppression, it’s Airborne Suppression. First up is simply thinking about how viable these roles might be for the Jäger in general, setting aside for now whether it’s the best option. Airborne Doctoring sounds real neat but I think is easily dispensed with in any general discussion so this post won’t talk about it more. For that to make sense you would need to have a specific plan and very expensive key trooper to support. There are very low odds it’ll pan out—that critical trooper needs to not be outright killed, in a position readily reached from the sides, and pass a PH-3 roll. Airborne Engineering would be much more useful, because a TAG is generally much more valuable and it’s much less likely to be outright removed from the game. I would, for example, be very interested in such an Engineer to support my Seraph, because a regular Engineer can’t keep up with it 6-4 Super-Jumping up the board and even a Palbot would require spending orders to follow along with the TAG or run up to it once downed. Certainly seems that tucking into cover with an SMG in Suppressive Fire with a lot of flexibility to do so around the board as necessary is a useful ability. Being able to exploit weak points and uncovered angles to rob the enemy of Orders and weapons is also definitely a useful thing to do. A quick follow-on then is that if we’re specifically tailoring the Jäger to hunt troopers via Airborne Infiltration to get into close range and confident we can do so, then the Boarding Shotgun is indeed the weapon to take. For example, face-to-face against an Alguacile in cover at ≤ 8″, the Jäger SMG has a 40% chance of killing its opponent, with a 22% chance of the Jäger itself being killed. With the Boarding Shotgun though the odds improve to a 49% chance of killing the Alguacile and a 20% chance of the Jäger itself being killed. Roughly similar matchups in this tactic, such as the Alguacile being out of cover or in Suppressive Fire or fighting a Medium Infantry target instead, continue to favor the Boarding Shotgun. However, if we won’t be able to get into 8″, the SMG becomes dominant via its extra die, though generally by a somewhat slim margin. SMG can do 3 shots at DAM 13 with AP, cutting ARM in half. E/Mitter can do 1 shot at DAM 13 with E/M2, which forces two rolls on half BTS, failing either of which causes the target to become Isolated and TAGs/HIs/REMs to become Immobilized-2 as well. Some newcomers miss this due to the name, but Immobilized prevents attacks as well as movement. That’s likely a mission kill, most times it’s not going to do anything else that game. So the E/Mitter can possibly one-shot a TAG, but how likely is that? Those are of course best case scenarios, and the likelihood of getting into that position highly subjective. If the cliche that TAGs never leave their deployment zone bears out, it’s going to be difficult. Playing any of the several ITS missions that heavily encourage TAGs to move forward, you should have a better chance. For me, frequently fielding a Seraph whose whole deal is to advance hard forward, I’m pretty scared of this attack. The odds are also not impossible even in worse situations. Most TAGs have BS 14 and an HMG. Say your only chance is to go at one head-on. Within 16″ and the TAG not in Suppressive Fire, there’s a 34% chance the Jäger takes it down with the E/Mitter, 34% chance the Jäger goes down, and 32% of nothing happening. Of course it goes downhill from there, but that’s a better matchup than I would have guessed. All told, whether or not it’s the best approach or if it’ll even work are huge questions. But it’s at least not ridiculous on its face to send the 18pt Jäger TAG/HI Hunting. Pretty scared right now, actually. Finally, it seems completely reasonable to assume that a ~20pt AD Specialist might be pretty useful and efficient to send after objectives. Given that the Jäger might be applicable to at least the latter four of these battlefield tasks, we can start comparing to other unit options available, evaluating from the perspectives of each because effectiveness and relative cost varies per role. One of the most immediate comparisons for the Jäger is to Nomads Tomcats, which are also Airborne Infiltration with Specialist options and similar cost. I think the Tomcat’s abilities are well worth that short list plus a few points. A Combi-Rifle alone is valued at a point over a Boarding Shotgun (see, e.g., Crusader Brethren and Akalis Commandos options for fairly direct AD troop comparisons), covering the difference between that Jäger profile and a Specialist Tomcat. Regular and Climbing Plus are probably each worth a couple points, and +1 BS another. Suppression: Generating a Regular order combined with +1 BS, other abilities, and greater utility of the Combi-Rifle for +1pt tips this role toward the Tomcat. Trooper Hunting: At close range the Tomcat with a Combi-Rifle would do 3 shots on 15s while the Boarding Shotgun Jäger does 2 shots on 17s. Against a BS11 Alguacile with a Combi-Rifle in cover, the Jäger Boarding Shotgun would hit & win 49% of the time while the Tomcat Combi-Rifle would only win 43% of the time. However, if the Alguacile is not in cover, the Tomcat would hit & win 62% of the time while the Jäger would hit & win 60% of the time. Further, at ≤ 16″, even with the Alguacile in cover, the Tomcat Combi-Rifle leaps out ahead: 43% win versus just 27% win for the Jäger, and that pattern continues for not in cover and other situations. The Tomcat Combi-Rifle would also of course dominate the Jäger SMG due to the range bands and higher BS, except against less common targets where the AP or Shock ammo on the latter really matter. So, this role could be swung by a small set of specific expected situations, but considering the Combi-Rifle’s wider applicability and that it alone usually costs 1pt more, combined with the Tomcat’s other advantages, for +1pt I’d say this role goes to the Tomcat. TAG/HI Hunting: Tomcat also has an E/Mitter option at just 2pts more, as well as a D.E.P. option at just +1pt (AP+Explosive though Disposable 1), so with its better stats and other abilities this role as well seems to tip toward the Tomcat. Button Pushing: Climbing Plus is very very helpful toward getting to objectives after walking on hidden, so I think that plus better stats for just +4pts tip this role as well toward the Tomcat. So unless I’m mistaken or misjudging, there’s no reason for Nomads players to take a Jäger unless they’re desperate for a couple points. The very similar Tomcat is better at each of the Jäger’s battlefield tasks and costs only slightly more. Haqqislam and Ariadna also have very similar units among their Parachutists, and I wouldn’t consider them dominant (better in all roles) as I would the Nomads’ Tomcat. For Haqqislam, Bashi Bazouks are very similar to the Jäger but cheaper. Suppression: Bashi Bazouk is better as it’s cheaper (in some cases much cheaper), has Holoechoes and better ARM, and selecting a deployment location in advance doesn’t hinder this role as much. Trooper Hunting: Many will debate this hotly in favor of the Haqq troop, but I think there’s some competition between these units for this role. The Boarding Shotgun Bashi Bazouk is a big 6pts and 0.5 SWC cheaper, and has Holoechoes. But for this role it’s just so useful to not have to commit to a deployment segment in advance that I would consider, but not necessarily choose, the Jäger. TAG/HI Hunting: Somewhat surprisingly, this is a close call, I think leaning toward the Jäger. The two unit’s SMGs of course have the same effectiveness, so with the Bashi Bazouk’s considerably lower cost that’s a question of how effective that weapon might be in this role. Comparing the Jäger E/Mitter to the Bashi Bazouk’s AP Rifle though, at their shared best situation, from the back at ≤ 16″ so good range and no ARO, the E/Mitter has a 54% chance to disable a typical TAG, while the AP Rifle has a 72% chance of doing at least one wound, 27% of doing 2+, and 4% chance of 3+ wounds. To a large extent these are doing different things, going for a lower probability (but likely) quick kill versus a more reliable whittling down. So comparisons from there get complex: Airborne Infiltration versus cheaper Parachutist with Holoechoes? How long will you actually live to whittle down a TAG? The Jäger of course also has both SMG and E/Mitter. At minimum I would say there are reasons to at least consider the Jäger for this role. I personally am probably slightly more inclined to try for the one-shot kills. Button Pushing: This task of course goes to the Jäger as the Bashi Bazouks have no Specialist options. It doesn’t seem to be the case that Bashi Bazouks are a strictly better choice than the Jäger across all roles. Indeed, at the very least there are reasons to consider the Jäger for Trooper Hunting, and very much so for TAG/HI Hunting. The Jäger in turn also isn’t obviously better or as efficient, but it’s at least competitive enough to be a plausible alternative selection. And of course there’s relative utility in the Jäger as a flexibly forward deploying Specialist, which Bashi Bazouks simply can’t do. Ariadna also has very similar troops in its Para-Commandos and Airborne Rangers. Suppression: This is tight, but I would give it to the Para-Commando at 20pts and no SWC. 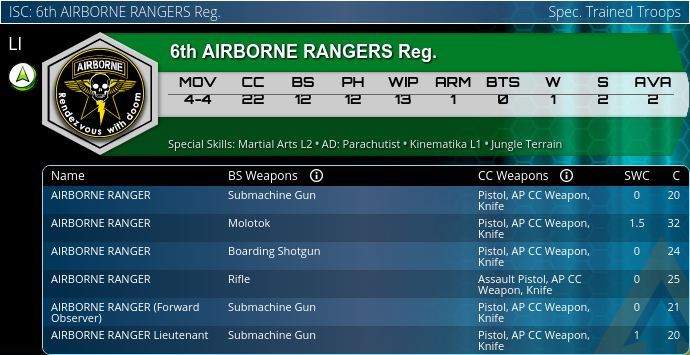 In this role you can often plan in advance where to AD the unit, so parachuting isn’t a huge disadvantage. The other two units have a better gun for Suppressive Fire, which equalizes the range bands between the Rifle and SMG but keeps the latter’s AP or Shock modes. However, the Para-Commando’s Mimetism will help it win firefights. It will also provide a Regular order while it sits there. Trooper Hunting: This goes to the Jäger. The extra point of BS on the other two is maybe worth the couple extra points, and the Para-Commando’s Mimetism is a big plus. But being able to choose where to walk on based on the current game situation is such a huge advantage in assassinating something. Being Irregular also isn’t a huge disadvantage for this role because it’s frequently sacrificial. TAG/HI Hunting: The Jäger is a cheaper SMG than the Ranger, but otherwise these units go at this role in totally different ways. At minimum there’s space to consider the cheap E/Mitter approach of the Jäger versus the Ranger’s Molotok or Para-Commando’s HMG, especially given its higher AD level. Button Pushing: This is a toss-up which I would maybe give to the Para-Commando. Flexibility to arrive on the battlefield wherever is best is important, but if you’re running at an objective you can also do a lot of advance planning. So the Para-Commando’s Mimetism and higher WIP probably edge out its inferior AD. Spetsnazs also have Parachutist profiles, but at considerably more cost (starting at 31pts) and no Specialists. Ariadna also has a variety of units with Infiltration at similar cost that provide strong competition for the Jäger in these roles. I would guess though that at minimum it might still have a place in the two Hunting roles, because it’s just so useful in those to be able to deploy precisely where needed to best hit a juicy target. For PanOceania, my primary faction (albeit in MO and SA sectorials), the Jäger is also interesting. The most similar unit is the Akalis Sikh Commando, of which I am a big fan. The Akal Command starts just a few points more than a Jäger and has +2 BS, +1 ARM, +1 PH, and +1 CC, with the downsides of being slower (2″ secondary move) and -3 BTS. The value of Religious is somewhat subjective as it depends on what you usually want to do with the troop. I think it’s mostly a strong benefit that occasionally gets your unyielding dudes killed. Combat Jump versus Airborne Infiltration is strictly better but, again, may not actually be more useful depending on play area size and terrain density. Suppression: Combi-Rifle at +2 BS, +1 ARM, Religious, and Combat Jump for +3pt tips toward the Akal Commando for being more likely to win shootouts and hold its ground. E.g., in Suppressive Fire against an Alguacile at close range, the Akal kills 45% of the time and dies 28% of the time, while the Jäger kills just 35% of the time and also dies 35% of the time. Trooper Hunting: Boarding Shotgun at the same cost and less SWC with better ARM and Combat Jump means the Akal is strictly better than the Jäger for this role. TAG/HI Hunting: With an E/Mitter at +6pts, and a Hacker or Spitfire at +10pts, there’s space here to consider the Jäger. Comparing the E/Mitter options straight-up, it’s close: Again in the best situation, the Akal has a 61% chance to one-shot a typical TAG, while the Jäger has a 54% chance. For +6pts I’m not sure that’s worth it, especially with the Jäger having Climbing Plus and the Akal only +1 ARM and -3 BTS. Either way, it’s enough of a points difference that the Jäger might fit in a good number of lists that the E/Mitter Akal doesn’t, especially in RECON+ games. Button Pushing: At +10pts for a Specialist, there’s almost certainly space here to consider the Jäger, particularly if you generally won’t see the benefits of Combat Jump versus Airborne Infiltration. Crusader Brethren, the other PanO AD trooper (setting aside Kirpal Singh, a 35pt Akal character), cost more than the Akal but has +1 ARM and +3BTS. So, off the cuff it’s a tough call between the Crusader and the Akal Commando for the Suppression and Trooper Hunting roles, but the Jäger doesn’t win either way. For TAG/HI Hunting the Crusader has HMG and Spitfire options, so it’s debatable between that and the Akal Spitfire. But all of those are a different and more expensive approach from the E/Mitter, leaving the Jäger viable versus the Akal’s E/Mitter as discussed above. There’s no Specialist option at all for the Crusader, so it also leaves space there to consider the Jäger since the Akal isn’t an auto-select for that role. Among the other PanOceania units, I don’t think there are options that dominate the Jäger for the latter two roles at its cost and in the fashion it approaches them. The Specialists with Infiltration all cost quite a bit more (starting at 27pts for a TO Camo Spec Sergeant Forward Observer), which might be worth it for their various abilities and equipment but leaves a place for the Jäger in low-cost flexible Button Pushing. I’m not as familiar with the other factions and there aren’t as direct comparisons as the Tomcats and Parachutists—unless I’ve missed some there aren’t other low-to-moderate cost Airborne Infiltration or Parachutist units in the vanilla factions, excluding a few somewhat pricier characters here and there. But almost certainly space to at least consider the Jäger for Button Pushing. Here again I think the Nomads have better options in their faction already unless you really can’t squeeze out the points (and the Tomcat dominates anyway). Among all the others though the point savings are significant enough that it’s worth considering the Jäger. For example, in RECON+ games I see the boundary of what I can usually scrounge up without changing the basic character of a list as being about 4pts, which all these options are well over. The counterpoint to that is if you significantly value Combat Jump over Airborne Infiltration; think the Irregular Order is a real limitation; or will make use of the faction unit’s other abilities, such as hacking. I started looking into the Jäger because I enjoy using Airborne Deployment troops extensively and wanted to see if it’s worth considering. Many people on various forums have of course immediately decried the Jäger as trash completely useless to everyone. I disagree with those takes. If you break down the analysis by battlefield roles, there’s most likely a place for the Jäger in every faction except Nomads. Even against Haqqislam Bashi Bazouks, for example, cited by some as totally superior, the Jäger seems at least competitive in several roles, and can fill one they cannot. More generally, I hope newer Infinity players take away the idea that there’s often limited use in just comparing units generically. You have to evaluate units and their profile options in context of how you’re planning to use them. Of course the ability for a unit to adapt and cover multiple roles as the situation changes is very important. But in choosing a list you should be thinking of your strategy and evaluating efficiency and effectiveness of units and options in light of the specific tasks that plan entails. Most of us do that intuitively, but it’s worth explicitly framing the process. 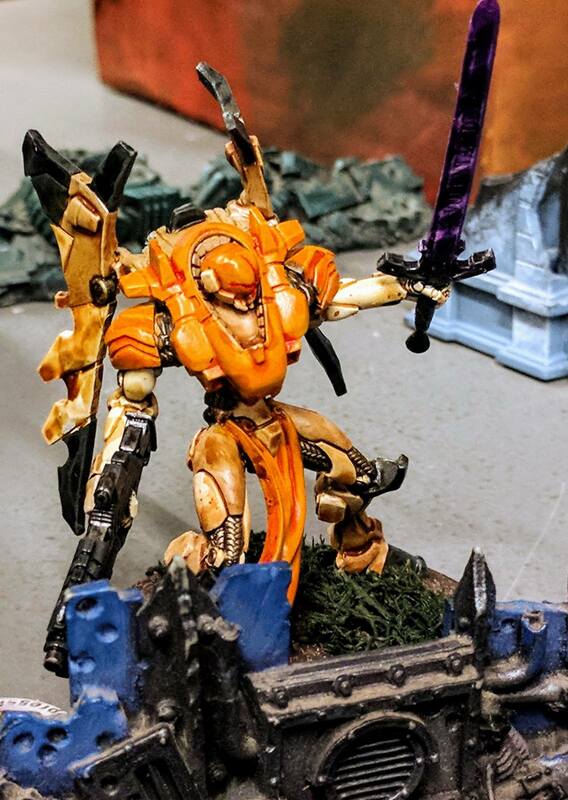 This entry was posted in miniatures and tagged featured, featured tactics, infinity, miniatures, tactics. Bookmark the permalink.